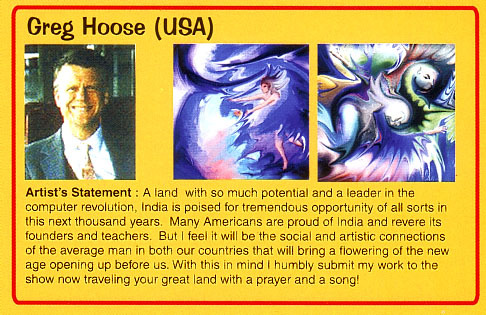 Yoart.com is reviewed separately in this gazette (see contents). This is therefore about how it expanded its area of operations from just the Internet to the real world,.. in Preeti Gopalakrishnan's and Yogi Chpra's own words. 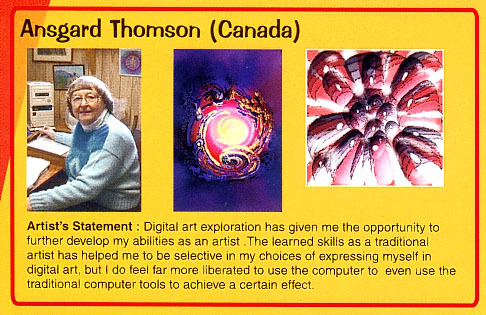 "We decided to bring the artworks from cyberspace down to our own world and display the artworks. At this point of time, Dr. Rodney Chang a.k.a. Pygoya's attention was caught by this Indian site, which was the first of its kind at that time. 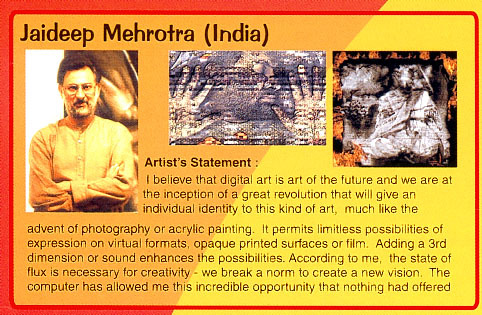 He was the mentor of China's first Digital art exhibition held in Shanghai and was looking at doing the same in India. 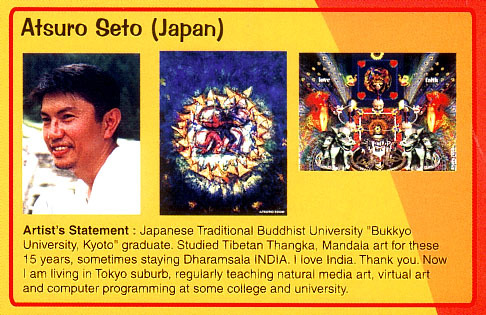 He approached Yogi and a fellow-digital artist from Calcutta, Shubhojoy Mitra and soon India was on its way to having the First India International Digital Art Exhibition, in Calcutta." 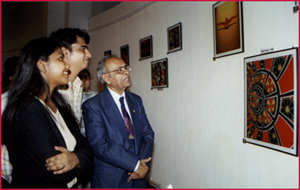 "The 1st INDIAN INTERNATIONAL DIGITAL ART EXHIBITION, CALCUTTA, was held at the prestigious Oxford Bookstore-Gallery, Calcutta, from whom we received tremendous support and backing. 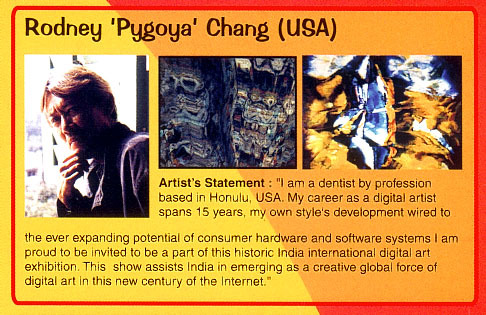 The show was organized in collaboration with Cyber Brains, the brain child of Dr. Rodney 'Pygoya' Chang, a cyber artist and Web Art Guru based in Hawaii, who has the distinction of being the pioneer of this artform in China. 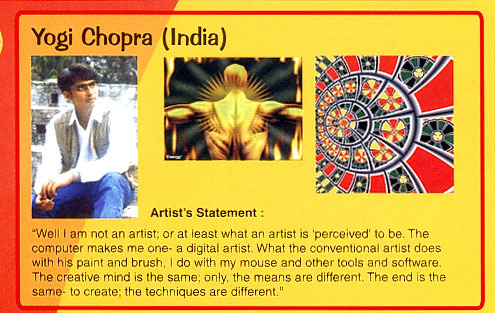 Dr. Rodney Chang along with 10 other international Digital artists including two Indians, Shubhojoy Mitra from Calcutta and Yogi Chopra from Mumbai participated in the event. Dr. Chang was the only visiting artist for the show. He addressed a small but distinguished group of artists and art critics at the US Consulate on the scope and future of this modern artform. 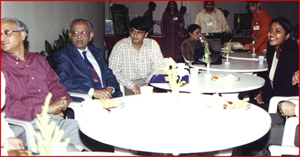 Caltiger, a leading Internet Service Provider (ISP) sponsored the show catalogues and brochures. 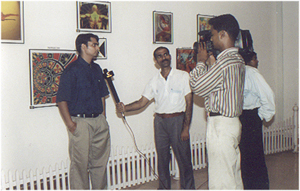 The Calcutta show received an impressive response and extensive media coverage, and was followed up with the 2nd India International Digital Art Exhibition in April 2000, Mumbai. 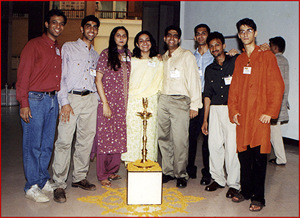 "ARTFEST 2000 ~ this happened when Yoart as a member of The Kala Ghoda Association, was eligible to take part in the cultural and Art festival organized by it. We decided to capitalize on the opportunity to have our 1st solely organized exhibition, which we called 'Infinite Visions'. 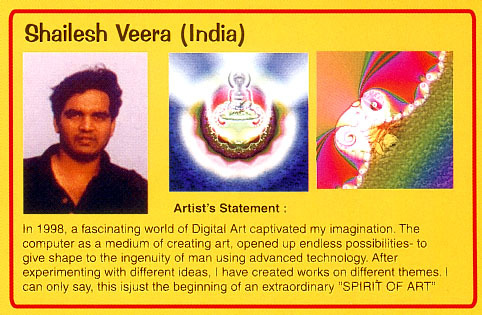 Our vision was, is and always has been to promote Digital Art in India and this according to us was a good chance to do so. We booked our stall space and were extremely happy to note that we were allotted a panel just outside the Jehangir Art Gallery, the hub of 'artivity' in the Kala Ghoda crescent. "The Kala Ghoda area of Mumbai has in its precincts, premier art related and educational institutions like the Prince of Wales museum, National Gallery of Modern art and Jahangir Art Gallery. 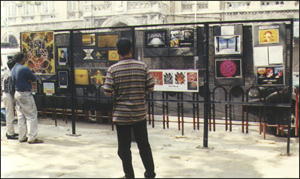 The Kala Ghoda association organized Artfest 2000, for the 2nd consecutive year this year. Yoart.com as a member of this association, participated in this event from the 1st to the 7th of February. Artworks of Larry Carlson, Ankur Gupta, Brent Brumfield and Yogi Chopra were displayed on the Pavement Gallery. 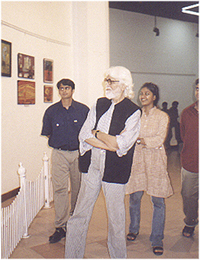 The exhibition was well received as we could reach out to all kinds of people be it artists themselves, art connoisseurs, art lovers or even mere passers-by. The exhibits evoked a good response. 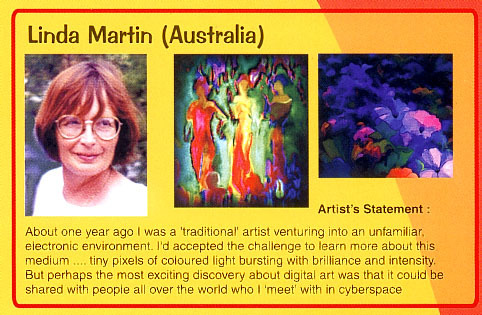 "It may surprise some people that "what's so great about having an exhibition on the pavement"? Well, I might say that that was a very important factor in getting reach- reach to every kind of people. We could reach out to all sorts of people from professional artists, art connoisseurs, art lovers and even the passer-by stopping to scrutinize an artwork that caught his attention. 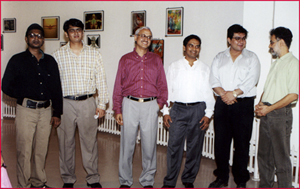 "It all began when we were informed that as members of the Kala Ghoda association we have access to the panels around the museum and art gallery. So we got down to making arrangements to print out the artworks, designing our distribution pamphlets, getting the artworks framed- mind you on a very slim budget 'cos all the expense was from our pockets after our would-have-been sponsor rejected our offer on the grounds that "you are actually gonna display Digital Art on the pavement!" 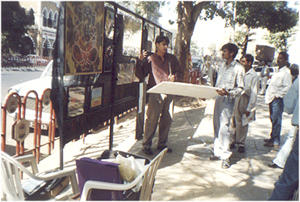 Low finances, loads of hard work, a whole week of sitting on the pavement, coming early in the morning, staying on till dark and high morales- all of these characterized the exhibition. 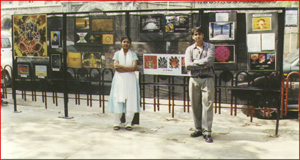 Having done all that we were now prepared to take on our first exhibition- of course, having helped out in the Calcutta event did help. We were all set to take the pavement by Art! "Come February 1st 2000, and we were damn excited about setting up our stall. We reached the venue early, put up all the artworks and what we realized was that it looked absolutely empty!! There were large gaping spaces in between 'cos there weren't enough artworks to display, which we could attribute to low finances. 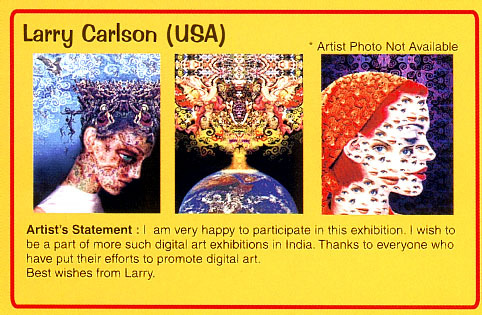 The artists featured during the weeklong affair were Larry Carlson, Brent Brumfield, Yogi Chopra, Ankur Gupta & Girish Menon. We resolved to print out more artworks the next day and also give it a more professional look. And that's exactly what we did. However, February 1st saw just a trickle of visitors which we had almost expected, considering it was a working day. As the day wore on however, towards closing hours of office more and more people started visiting the Jehangir Art Gallery and consequently our little stall. So you see how important our positioning was. A stall further down the pavement would not have has as much effect as ours had had. The following days of the week also proved to be pretty productive as we were truly able to reach out to so many people. 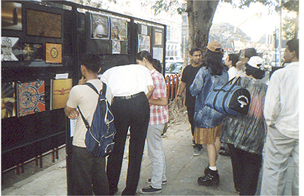 We were even pleasantly surprised when a horde of bus conductors came by, examined the artworks of interest and asked a couple of questions and even commented on them. Then we got a major breakthrough when as we were as usual being our cordial selves and explaining the aim of our site et. 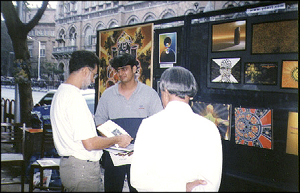 al., we realized that none other than Jaideep Mehrotra, one of Mumbai's eminent digital artists was among those who were at the stall. We capitalized on the chance, introduced ourselves personally and expressed to him our desire to talk to him and discuss his work. And he was kind enough to respond to our request. Then he gave us his opinion on our work, on the future of digital art and signed our guest book. 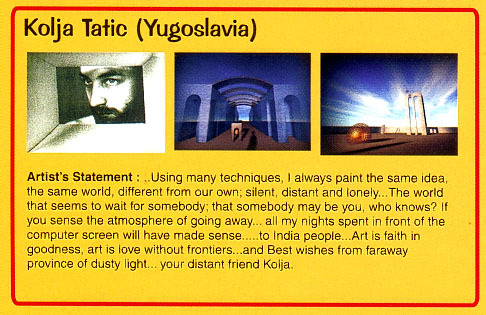 Now we knew that we had established a good contact (among our first few, I might add) in the art world. The whole week did get us some good results and we had a whole bunch of interested persons from the media, advertising world, artists and designers who had visited our stall and gone away happy. 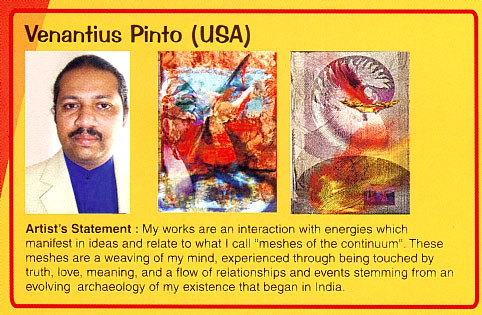 "I believe that this experience has been a very fruitful and learning experience. 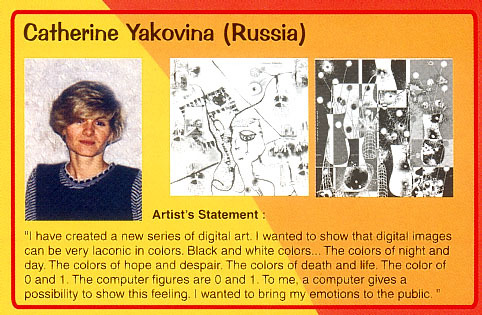 I just hope that this experience will open new frontiers for Yoart.com and will take us to higher realms of digital art, truly the Art of the Millennium." 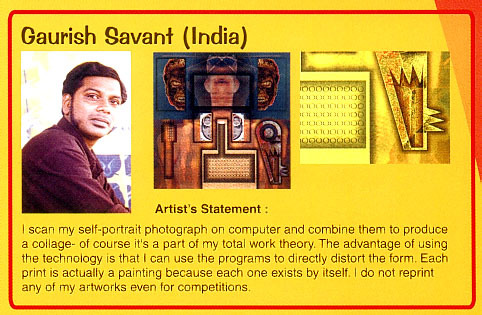 "The 2nd INDIA INTERNATIONAL DIGITAL ART EXHIBITION, MUMBAI (video at top) ~ After the success of the Calcutta show, Yoart.com was inspired to organize the 2nd India International Digital Art Exhibition in Mumbai, the fountainhead and hub of cultural transfusion in India. With more and more Mumbaikars metamorphosing into a population of techno savvy artists and art lovers, the choice of the city was pretty obvious. 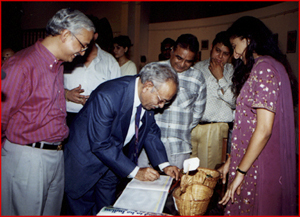 The exhibition was inaugurated by Former Sheriff of Mumbai, Mr. Nana Chudasama on the 11th of April 2000, at the Nehru Centre Circular Art Gallery, Worli. 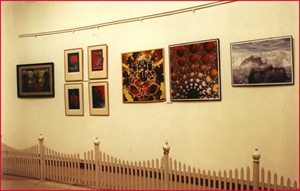 It was open to all art lovers from the 11th to the 17th of April. 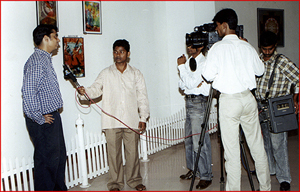 The sponsor of the exhibition was MumbaiMart.com. 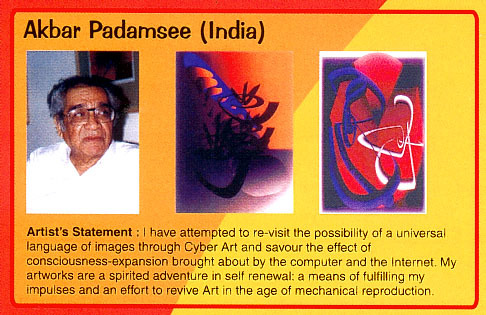 The exhibition showcased the works of eminent Digital artists Akbar Padamsee and Jaideep Mehrotra as also Rodney Chang, Gregory Hoose, Venantius Pinto and Larry Carlson from USA, Linda Martin from Australia, Catherine Yakovina from Russia, Ansgard Thomson from Canada, Kolja Tatic from Yugoslavia, Atsuro Seto from Japan and Gaurish Savant, Yogi Chopra, Shailesh Veera, Samit Madan and Ankur Gupta from India. 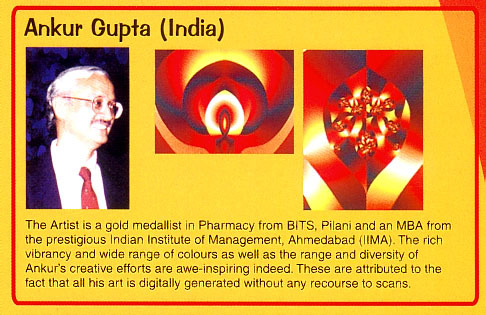 The artworks range from abstracts and sharply etched works with a combination of software and techniques and geometric shapes blending into an array of rich hues and 3D effects. 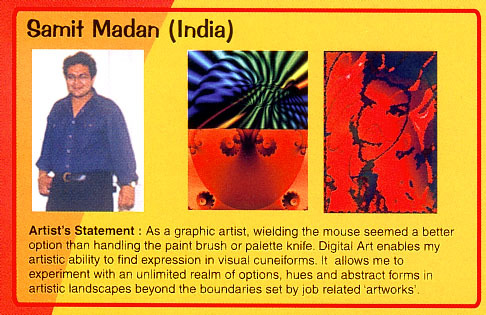 "The 2nd India International Digital Art Exhibition was very well received in media and art circles."